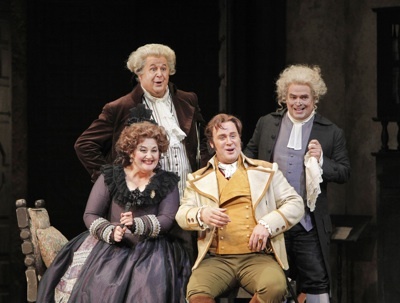 After more than two hundred years, Le nozze di Figaro still manages to keep audiences entertained in opera houses around the world – even more so when a terrific cast is combined with careful direction, able to exploit all the comic nuances of the opera without pushing them too far. This is precisely the case of this Figaro directed by John Copley and that opened on 21 September at the War Memorial Opera House. The San Francisco Opera concept represents one of those cases in which straightforwardness is a virtue: this staging has been seen many times, but never ceases to be functional in its essentiality. The settings indicated in Da Ponte's libretto – a room in the Count's villa, the Countess' room, the courtyard and the garden – are meticulously created on stage: an unpretentious space and carefully-chosen props serve the opera effectively. Lighting by Christopher Maravich is also one of the reasons why this staging still works so well: one example is the initial scene of Act II, in which the Countess' lament of "Porgi amor" is supported by delicate but emphatic lighting that helps to convey the woman's emotional solitude. It was also thanks to such subtle detail that this production, while relying heavily on the comic aspects of the opera, managed to convey some of its gruesome undertones – such as the private tragedy of the Countess and disturbing presence of the feudal ius primae noctis. Nonetheless, it was bursting comedy that came across powerfully on stage. 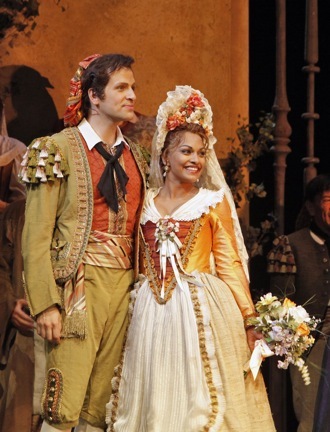 Danielle De Niese, playing Susanna, does have a talent for comic opera, as the New York Times wrote after her appearance in Jonathan Miller's production of Figaro at the Met. Her long-waited SF Opera debut was a success. The young soprano's voice can be thin at times, but her bright, electric colour together with the precision of her interpretation made of her Susanna a thoroughly multi-dimensional character. De Niese also benefits from her phenomenal acting skills: she is completely at ease on stage, able to interact naturally and effectively with all her colleagues. Luca Pisaroni as Figaro was equally convincing. On the vocal side, his timbre is somewhat feeble compared to others who have interpreted this role – Bryn Terfel or John Relyea come to mind. And yet, I found his interpretation impeccable. His physicality and his use of the space showed his performative sensitiveness: he truly knows this opera well and manages to give each facet of his role deep vocal and dramatic nuances. Each one of his numbers was effective. For me, he gave his best in the Act III finale and in his "Aprite un pò quegli occhi" – so enjoyable. Ellie Dehn's interpretation of the Countess was unsteady at first. As she warmed up, her voice began to feel more solid and reliable. Due to her warm and gentle timbre, the most frail and delicate nuances of her character surfaced. She acted with the highest grace. I had similar mixed impressions of Lucas Meachem's Count: while he surely built a consistent character, emphasising the Count's clumsiest side, his vocal performance was uncertain at times. On the other hand, the few weaknesses of his interpretation did not have too negative of an effect on his performance, which was on the whole satisfactory. The four protagonists were surrounded by solid comprimario characters and all the ensemble numbers were incredibly precise, both from a vocal and from a dramatic perspective. In particular, the Act II finale came across as a little masterpiece of coordination and singing. Catherine Cook as Marcellina was a joy to watch and hear; John Del Carlo's Dr Bartolo vacillated slightly, but his acting performance was terrific, and the same was for Greg Fedderly's Don Basilio. Adler Fellow Sara Gartland offered a beautiful and witty portrayal of Barbarina, with her light and lively timbre and intelligent acting. Michèle Losier was a convincing Cherubino, even if her darker tone somewhat contrasted with the role she was interpreting. The SF Opera audience is used to thinking that Nicola Luisotti's speciality is 19th-century Italian opera. It was the first time, for me, to see him perform a piece from the earlier repertoire, and I was pleasantly surprised to witness a truly successful reading by him and his musicians. There were a few moments in which some sections lacked a bit of precision – the strings, for instance – but as for expressivity, dynamics and passion it was certainly a winning performance. It was also Luisotti who acted as fortepianist, playing with skill and irony, in wonderful harmony with the stage. A hint of the particular care that the music director took in preparing this run of Figaro, and of his period-awareness, is revealed in the liner notes: they explain that at the request of the conductor, the level of the orchestra pit has been moved two feet higher than the usual level "as a nod toward the practice of the eighteenth century when opera orchestras were customarily seated at or near the level of the audience." There was another reason for this Figaro to be a festive event: stage director John Copley was awarded the San Francisco Opera Medal, the highest honour given by the Company to an artistic professional. Copley debuted with the SF Opera in 1982 with Handel's Giulio Cesare, and this Figaro is his thirtieth engagement. At the end of the performance, general director David Gockley joined the cast on stage to award Mr Copley personally. With class and humour, this latter gave speech that was at once playful and moving: he admitted how delighted he was to be a diva among many other divas who had been awarded the same prize (among them Leontyne Price), and how blessed he felt to collaborate so closely and so frequently with a Company whose artistic stature matches its great humanity. Interviews with Danielle De Niese and Luca Pisaroni about this production and their projects are forthcoming.